Hello and welcome to Day Six of our February Rubber Die Release Showcase! On Wednesday (22 February) Whimsy Stamps released this month’s rubber designs and new Shapeology dies. From then until 28 February the Whimsy Stamps DT and Special Guests are showcasing these fabulous new stamps and dies with a daily mini blog hop. To be entered into today’s mini blog hop prize draw, be sure to leave a comment on ALL of the DT’s posts listed below by 12.00PM EST tomorrow. All winners will be announced on the Whimsy Inspirations blog on 29 February. For my card today I chose to use Meljen’s Dragon’s Little Friend. It was stamped in Tuxedo Black Memento Ink on Neenah Solar White cardstock. The image was cut and embossed with aClassic Square Nestabilities die and colored with Copic Markers (Dragon: Y13, Y15, Y17, YR15, YR18, YG21, YG23, YG25 Butterfly: BG45, BG49, YG21, YR15). The image was masked , Cloud mask dies were added and the background was airbrushed with Copic Marker BG11 (to make it match the background paper). The clouds were colored with Copic Markers W00, W0, W1. Stardust Stickles was added to the tiny circles. The image was adhered to a piece of Solar White cardstock, cut and embossed with the largest Postage Stamp Nestabilities die. A 4″ x 4 1/4″ piece of Pink Paislee’s Hometown Summer patterned paper was adhered to a 4 1/4″ x 5 1/2″ piece of the same paper pack. The bottom corners were rounded and May Arts ribbon was tied around the layers before the papers were adhered to the card base, a 4 1/4″ x 11″ piece of Solar White cardstock folded in half. A sentiment from Friendship Notables 2 was stamped in Tuxedo Black ink, colored with Copic Marker BG10 and adhered to the lower right of the layers. Parts of a Finesse Rhinestone Swirl and additional Rhinestones finish off the card. Thanks for stopping by and don’t forget to check the Whimsy Inspirations blog tomorrow for more new release creations! I love the dotted colouring on the dragon. It’s a gorgeous card. Super cute card. I LOVE how you did the sky behind the little dragon, it looks fantastic. Hugs! I love the way that you colored this awesome Meljen stamp! Your card is beautiful! 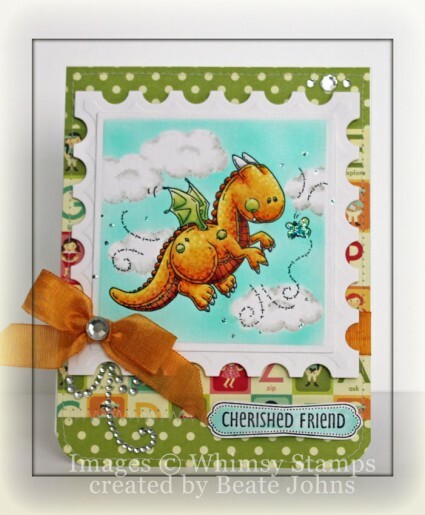 I absolutely love this little dragon and, as always, your card is beautiful!!! Thanks for a chance to win. Such a nice, bright sunny card! Love the colours you have used for this adorable image. Super cute card!!! Love that die!!!! I love the way you have coloured the dragon – so realistic! I’m glad you used the sweet little dragon. He didn’t get showcased very much and you did a beautiful job with him. a marvellous and very charming card! So Cute !!! I love the stamp shape… Sooo Cute.. And i love the coloring..
Gorgeous coloring and airbrushing! Great design! Beate… this is over the top adorable! Awwwww, he looks amazing!!! Love your colouring and background (i say that every time…) and the papers are fab!! What a cute card. I love the image. TFS. Beautyful colors in combination with the designpapers. Great card. This dragon is simply wonderful. Beautiful composition. Deine Karte sieht wieder toll aus. Das motiv ist so niedlich und wieder wunderschön coloriert. Klasse Idee das Motiv als Briefmarke zu machen. Alles in allem wieder eine super Karte! What a fabulous card Beate! But that’s no surprise! You are so talented. Love that little dragon. TFS! Super sweet card Beate. Love how you colored the little dragon! Fabulous color combo too!! what a lovely card again. Stunning card Beate, love how you coloured this cute little dragon and the sky background looks amazing! I just love this hun, he really does look like he is flying..love your clouds..your colouring is stunning, a really beautiful card! Hi! You made a wonderful card ! So original, I like it very much! What a gorgeous card! Very beautiful colors… lovely!! This turned out so cute! love the colors especially in the sky! 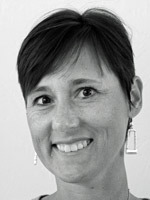 Just wonderful Beate! Gorgeous colouring of that dragon! Lovely card. The image is so cute and love the sky background. Wow Beate,what a sweet beautiful card,love the colour you gave him! I love the way you colored the dragon, the texture you have created is very beautiful! Have a wonderful day! Beate your coloring on this adorable image is fantastic! Love the postage edge die too-great layout! Love the coloring on that cute dragon! You are amazing! ohhh!! Beate very beautiful card and this stamp is so funny. What a cute stamp! Your card is great- some little kid would love to receive this card! Gorgeous coloring! I love the scene you created with the clouds!! That dragon is the sweetest thing! Adorable card! Oh, this is GORGEOUS! I just love her design’s and love what you did with it! Super fun card and I love the little dragon! Your choice of DP works so well with the coloring of the dragon. What an adorable card. This stamp is so cute. Thanks for sharing. Oh how I love this dragon, and so would my 3 grandsons! Another gorgeous card! Thanks so much for sharing! Such a cute dragon. Love it. This is so ADORABLE, Beate, and your colouring is PHENOMENAL!!! hee… so so adorable! love how you colored the cute dragon! amazing texture. fabulous work as always, Beate! love love this! This is just darling, Beate…and your coloring is so perfect!! I love your clouds and that cool postage stamp die as well!! OH my word Beatte! This is just one of the cutest little stamps and you have done it perfect justice with the coloring you have done on him! What a sweet card, it just tickles me the way you put all of yourself into your cards, this one is so animated and darling. Thanks for inspiring and sharing!